This August The Stress of Leisure are going to be joining the mighty Regurgitator on a national tour. 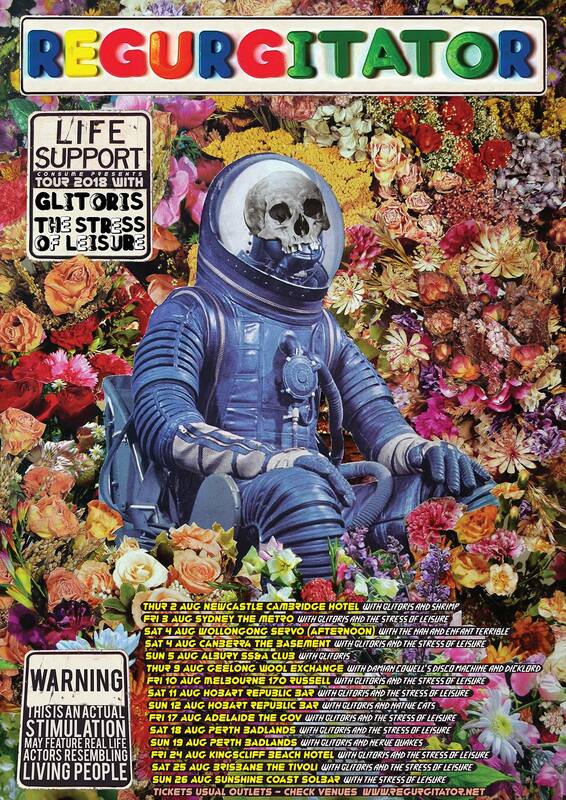 Also joining us are Canberra’s Glitoris. It’s all very excellent. Ever since the single ‘Blubber boy’ the Gurge have had an imprint on my musical brain. They were the band you heard at parties everywhere in 90s Brisbane, all types playing ’em on their stereos. So much fun, with a political conscience. Recorded their first full length album in a broken Bangkok studio, I remember that. I also remember to trying awkwardly dance to the ‘Kong Foo Sing’ in some Valley nightclub, what feels like eons ago. They’ve got lots of tunes to make you move actually. That’s probably why their songs from 20 years ago still live strong today. People love to have a good time! Looking forward to playing in Perth and Hobart for the first time, and as well Adelaide. This tour is going to be heaps fun. As long as Jane Elliott remembers to pick up the keyboard stand and ensure it is tagged and in oversized baggage, I think everything will go swimmingly well. Previous Post: Kid Congo And The Pink Monkey Birds!